Through the Image Comment feature on the Nikon D3400’s Setup menu, you can add hidden text comments to your picture files. Suppose, for example, that you’re traveling on vacation and visiting a different destination every day. You can annotate all the pictures you take on a particular outing with the name of the location or attraction. The text doesn’t appear on the photo itself; instead, it’s stored with other metadata (extra data, such as shutter speed, date and time, and so on). You can view the comment during playback in the Shooting Data display mode or along with other metadata in Nikon ViewNX-i and Capture NX-D. Some third-party photo programs and apps also may be able to display the comments. Enable the feature via the Image Comment option on the Setup menu, as shown on the left in the first figure. 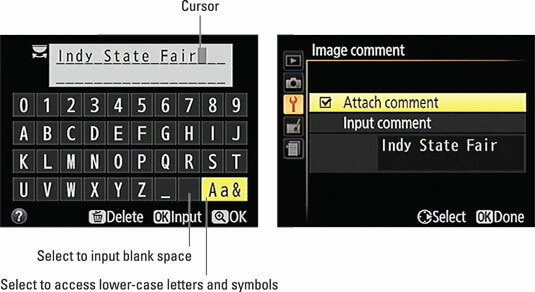 Press OK, highlight Input Comment, as shown on the right in the figure, and press the Multi Selector right to display the keyboard screen shown on the left in the second figure. You can tag pictures with text comments through this feature. Use the Multi Selector to highlight a letter and press OK to enter it. Enter a character: Use the Multi Selector to highlight the character and then press OK. Your comment can be up to 36 characters long. To switch from capital letters to lowercase letters, highlight the box in the lower-right corner of the keyboard — the one labeled Aa& and spotlighted — and press OK. Press OK again to cycle to a screen of special symbols. Press OK one more time to return to the initial set of capital letters. To enter a space, bring up either of the alphabetical screens, highlight the empty box to the left of that Aa& box, and press OK.
Move the text cursor: Rotate the Command dial. Delete a letter: Move the cursor under the letter and press the Delete button. After entering your comment, press the Zoom In button to display the screen shown on the right. You should see your text comment underneath the Input Comment line. Highlight Attach Comment and press the Multi Selector right to put a check mark in the box, as shown in the figure, and then press OK. The Image Comment item on the Setup menu should now read On. To disable the feature, revisit the Setup menu, select Image Comment, highlight Attach Comment, and press the Multi Selector right to toggle the check mark off. Press OK to make your decision official.